Apple Pippin has been decorated throughout in a coastal theme taking inspiration from the area. Apple Pippin has a classic off white shaker style kitchen which is fully equipped with everything you need. The kitchen has a gas oven, hob & grill, microwave, fridge freezer, toaster, pots, pans, cutlery, crockery, tea towels, tea, coffee & kitchen sundries are all supplied. Apple Pippin sleeps up to 4 guests in 2 bedrooms, one double & one twin. Bedrooms are made ready for you with white cotton bed linen, cushions, throws & hairdryer. The shower room has piping hot water, WC & basin as well as fluffy towels, toiletries & heated towel rail. The kitchen opens up into the light, bright living & dining room with Laura Ashley nautical stripe curtains & cushions on ample seating. This area has a TV/DVD player a coal effect electric fire, books, board games, local information. Outside you have a private, fully fenced garden with furniture, decking & private parking for up to 2 vehicles. Each room has a heater as well as a portable oil radiator. All bed linen including additional blankets and throws are provided at no extra cost. There is parking directly outside of your accommodation for up to 2 vehicles and plenty of additional parking on site. Two towels per person are supplied at no extra cost. There is a gas oven with separate gas grill and gas hob. Your accommodation has a small private and fenced garden and includes a decked area and garden table with bench. Golf can be played in Bude at The Bude and North Cornwall Golf Club, in Westward Ho! at The Royal North Devon Golf Club, Englands oldest course 20 minutes away or in Barnstaple at The Portmore Golf Club 35 minutes away. Notes on accommodation: Small DVD and book library Detailed information pack on surrounding area Laundry Room on site Free fishing from our on site well stocked pond Ample Parking Linen, towels and tea towels included Hair Dryer Iron available Outside: Each caravan has its own private enclosed garden which includes a decked area directly outside. Each caravan has a Barbecue and garden furniture. Bring your tent along and pitch it in your private garden as if staying on your own secluded site. At least if it gets too cold you can always go back in your caravan! If families or friends holiday together but stay in separate caravans there is a large gate which joins the two gardens that can be left open so you can easily go between the two. 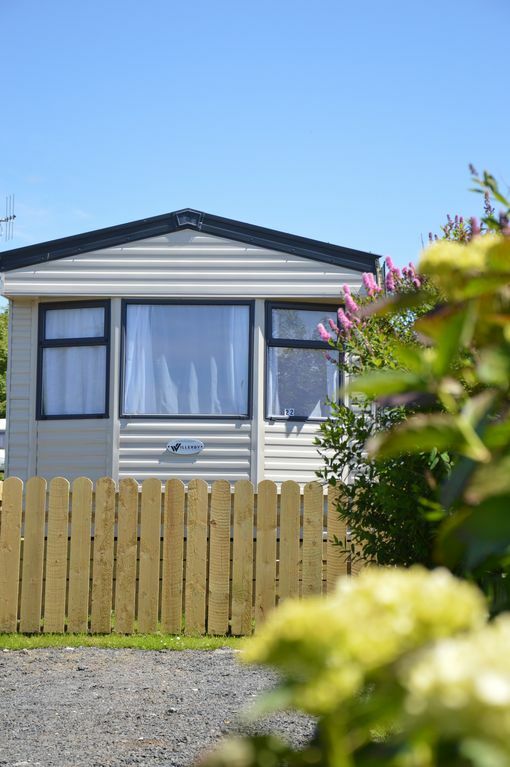 Our caravans being situated in one of four small fields allows you the freedom to walk within the grounds of our camp-site freely. Walk your dog around the site for a quick exercise or let the children just run around. Feel free to try your hand at a spot of fishing from our on site well stocked pond. A lovely spot where you can fish or just relax. Surrounded by trees and shrubs the pond field is a real sun trap where you will find picnic benches and a large decked area for your use. Zoe made our stay at Apple Pippin very comfortable & made us feel very welcome. She had thought of everything, even making sure our dogs were comfortable! Thank you!! Thank you Zoe for a lovely warm welcome. We had a very comfortable stay in Apple Pippin, and hope to be back before too long. We appreciated how well equipped and spotless the place was, with our own outside space and even a picnic table. The caravan was lovely and clean and had everything we needed in it. It had a homely feel about it with all the nice touches Zoe had spent time making it look cosy and relaxing. Loved the fenced off garden and seating area outside and we sat outside in the lovely February sunshine. My husband caught quite a few fish in the pond. It was great being in such close proximity to the village and fantastic walks nearby. Also not far to drive to Bude and Clovelly. Would have loved to have stayed longer. Great value for money , we will be back !! Cosy caravan for a seaside getaway. We decided to get away for Christmas. The caravan was cosy and well equipped and the welcome pack (complete with Christmas card) much appreciated. Carols around the tree in the Square on Christmas Eve, accompanied by Hartland Town Band, as special as ever. Thank you, Zoe. Spotlessly clean property, everything in working order, plenty of heaters and nice cosy duvets! Meet the owner the morning after we arrived and she was very welcoming and keen to help if needed. Hartland is a nice little village with 3 decent pubs, 2 shops, a chippy and a café, all 5 mins walk form the property. Good base to explore the area from Bude up to Appledore. The Rowan Tree in Clovelly has a number of craft courses available. The Plough Arts Centre in Torrington runs frequent art and craft workshops for adults and children and just because of our rural location we have an abundance of talented craftsmen and women who encourage a "have a go" mentality, so courses and opportunities can arise anywhere! Hartland is surrounded by beaches due to our proximity to the coast. We have a mixture of pebble and sandy beaches on our doorstep. Popular beaches are The Hartland Quay, Berry and Blackpool, all of which are only a 5 minute drive away. Head north towards Bideford for 20 mins and you will come across the long sands of Westward Ho! or 50 mins further to arrive at Croyde and Saunton Sands. Or head south for 15 mins to arrive at Sandymouth or a further 5 mins to the sandy Bude in Cornwall. Hartland is 40 minutes from Barnstaple which provides our nearest train station. National buses come into Barnstaple and Bideford and link with local buses which come to Hartland village and stop outside our entrance. Newquay and Exeter are our nearest airports. Our caravan site is in the village so a 3 minute stroll will take you down to the "hub" of the village. On our doorstep is Hartland Abbey, Hartland Point and Docton Mill. The Milky Way Fun Park is 10 mins away and The Big Sheep family fun is 20 mins away. Clovelly village is 10 mins and is world renowned. Torrington is 40 mins away and has RHS garden Rosemoor and Dartington Crystal. All times given are as if by car unless otherwise stated. A post office, which also has a wide selection of groceries and a great selection of wines, beers and spirits as well as the villages only cash point machine. The Pop In store which sells fresh bakery items, fruit, vegetables and a wide selection of groceries. Springfield Pottery selling beautiful pottery made by the famous Leach family. The White Hart Gallery selling a beautiful selection of originals, prints, cards and much more as well as offering courses. There are always lots of village events, from Fetes, Craft Fayres and coffee mornings to Garden Shows and a Carnival where the streets of the village come alive. The nearest attraction to the village is Hartland Abbey. A stunning Abbey set in beautiful grounds with regular events running throughout the year. On the outskirts of the village is where you will find Cheristow Lavender Farm, Docton Mill and Gardens and the ever popular Hartland Point with cafe. Eat in the village at The Hart, The Anchor and The Kings and walk home. For a night in pick up some fish and chips or have a local lady deliver authentic Thai to your caravan. Jump in your car for 5 mins to have a meal with a view at The Hartland Quay. Clovelly, Bude, Westward Ho!, Instow, Bideford, Parkham and Abbotsham all provide restaurants and pubs. For Supermarkets Bideford has Tescos, Morrisons and Asda or head to Bude where you will find Sainsburys and Morrisons. Banks and cash points and garages can be found in both Bideford and Bude. For shopping head to Bideford Town Centre for an array of small independent local shops, Atlantic Village for discount national stores and Barnstaple for high street stores. Booking Notes: On booking you will be sent a prepaid envelope with a confirmation of booking form for you to check and return along with a £50 non refundable deposit. The outstanding amount can then be paid 4 weeks before your arrival, if time allows or if not as soon as possible. Changeover Day: Generally change over days are on a Friday or Saturday, however I regularly have change overs on a Sunday and I am happy to accommodate any day which works with existing bookings. Notes on prices: Please note the price of £50 per night is based on two people sharing.